Our country flag lapel pins are one of our most popular products. This is great if you want to show love for your country, if you're heading to an international event, want to celebrate your heritage, or for any events or conferences. We offer many different flags to choose from and they all come with a bright, golden metal that will easily stand out. The flags are printed with a coloured enamel fill. This gives them a unique look and texture that's detailed and true to the original flag design. We use all the right colours, stripes, and details found on the flag itself, so there's no way someone will confuse this for something else. We do our absolute best to have every flag possible. We currently offer 170 different flag options for you to choose from. Be sure to check our full listing so that you can see all the flags we offer along with the correct product code for the flag you'd like. The country flag lapel pins have a butterfly clasp on the back that is highly secure and easy to use. Inquire today about getting a quote and we'll get back to you quickly with an accurate estimate along with a virtual sample sent directly to you. 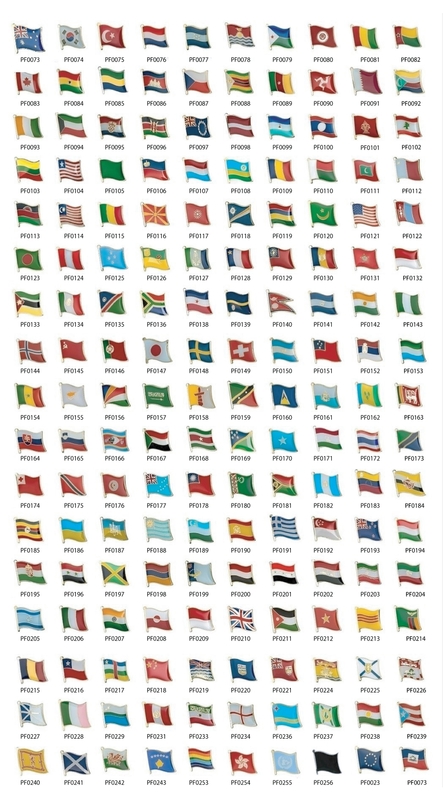 We currently offer 170 different flags to choose from. Each pin is made with a coloured enamel fill. The pin has a bright golden metal that shines brilliantly around the flag. The flags are highly accurate and detailed. When you're looking to show off your heritage, you're going to an international event, or you want to show how much you love your country, this is the right pin for you. Look through our large listing of flags and choose the one you love. Each one looks beautiful and we perfectly replicate the colours and details.